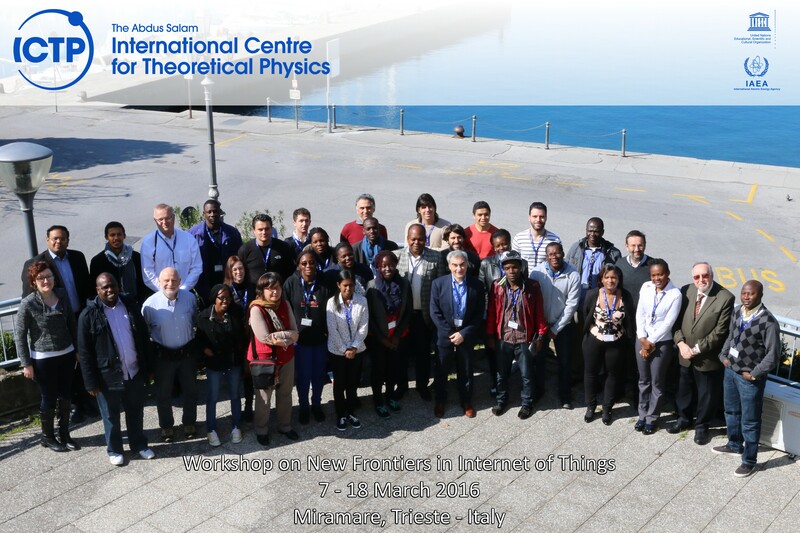 The Telecommunications/ICT4D Laboratory (T/ICT4D) of the Abdus Salam International Centre for Theoretical Physics (ICTP, Trieste, Italy), in collaboration with the University of Cambridge, the University College London, and the United Nations Economic Commission for Africa (UNECA), are organizing a "Workshop on New Frontiers in Internet of Things", to be held at the ICTP, Trieste, Italy, from 7 to 18 March 2016. This Workshop is co-sponsored by the International Telecommunications Union, Telecommunication Development Sector (ITU-D), the Internet Society (ISOC) and the United Nations Economic Commission for Africa (UNECA). The Internet of Things (IoT) refers to the networked interconnection of objects in addition to traditional networked devices. This new technology has the potential to change the world, just as the Internet did. This is starting to happen, as the continual decrease in size, cost, and energy consumption of wireless devices is increasing the number of mobile objects dramatically. The number of mobile objects composing the IoT will be huge: in 2020 between 12 and 50 billion devices are expected to be connected, a 12 to 50-fold increase from 2012. This implies that the traffic generated will explode. The huge amount of traffic will require standardized interfaces and a huge number of addresses, only possible by the utilization of IPv6. Applications of Internet of Things can greatly benefit people in Developing Countries: food safety can be checked, water quality can be monitored, air quality can be measured, landslides can be detected at an early stage and mosquitoes can be counted in cities in real time. In this Workshop we will look at applications of IoT, with a focus on low-cost, open and sustainable solutions. We will look at the social impact of IoT and how privacy and security issues can be tackled. We will discuss the best solutions in terms of connectivity and energy efficiency. Stephen HAILES (Univ. College London, U.K.), Joseph INTSIFUL (UNECA, Ethiopia), Arjuna SATHIASEELAN (Univ. of Cambridge, U.K.) and Marco ZENNARO (ICTP, Trieste, Italy) .